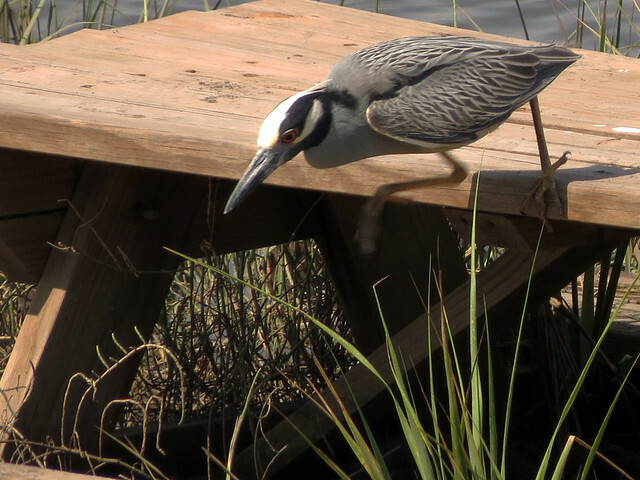 Late last month, Arthur and I visited Spruce Creek Park in Port Orange. It was hot and birds were keeping a low profile. Once we climbed up the 15-foot observation tower we had a very nice view over the property. 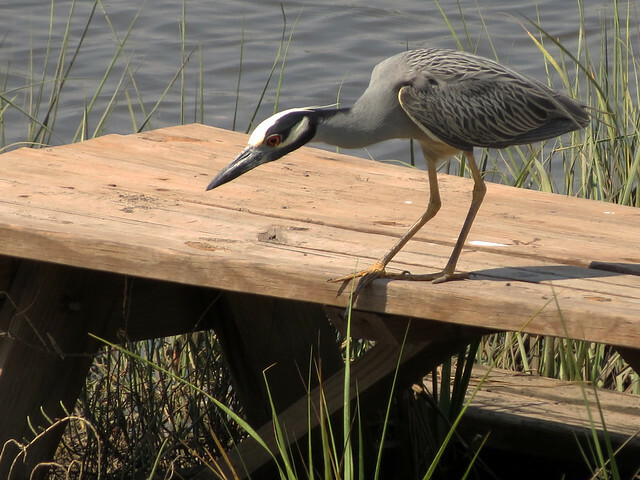 I spotted a heron sitting on a picnic table below us, and did a double-take when I realized it was a Yellow-crowned Night-Heron. 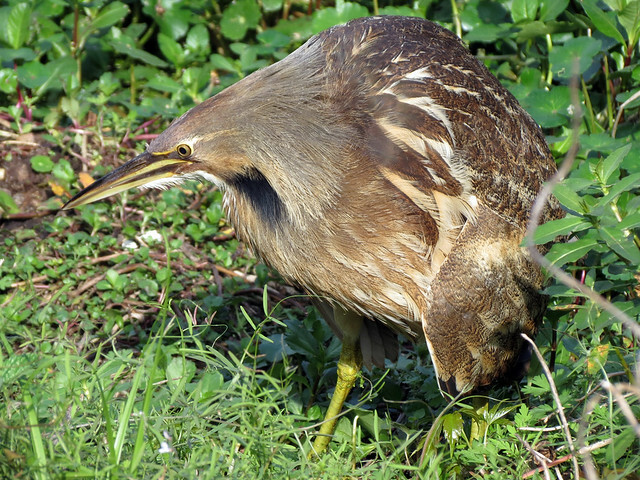 The bird hopped off the table and proceeded to successfully hunt a large amount of crabs in the mud. 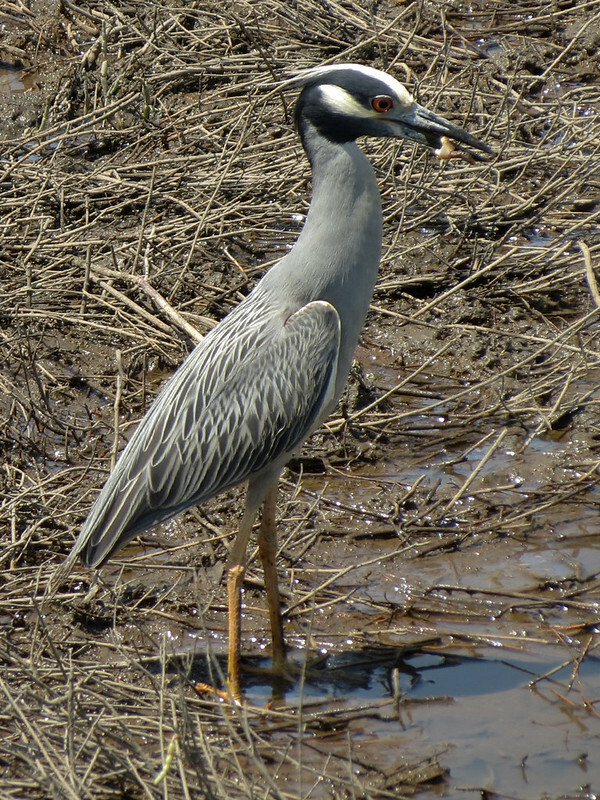 Timestamps on my photos tell me we watched the heron hunting for about a half hour, and I would guess it caught and ate a crab or other tasty morsel at least every two minutes. We climbed down the tower and proceeded with our hot mid-morning walk. 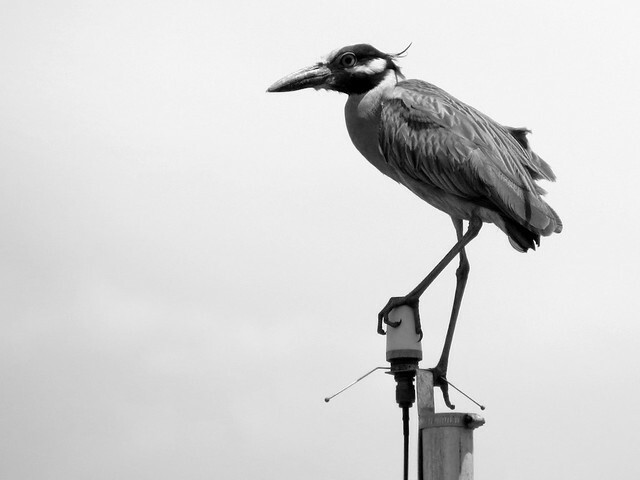 Later we came across another YCNH, this one awkwardly perched on top of some kind of weather apparatus (I think). It didn’t stay perched long. 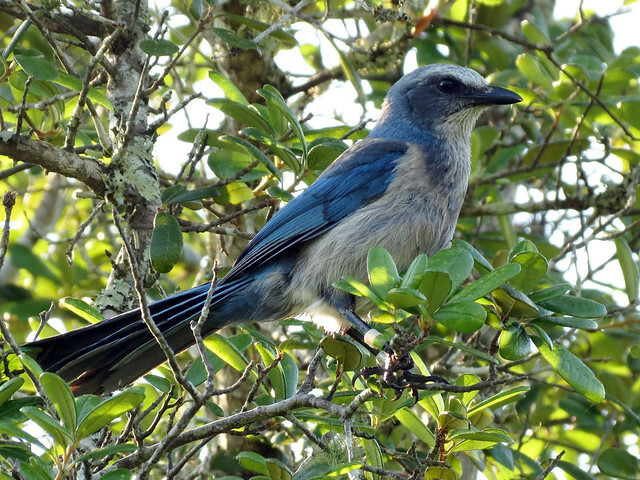 The Florida Scrub-Jay is the official city bird of Deltona, Florida. 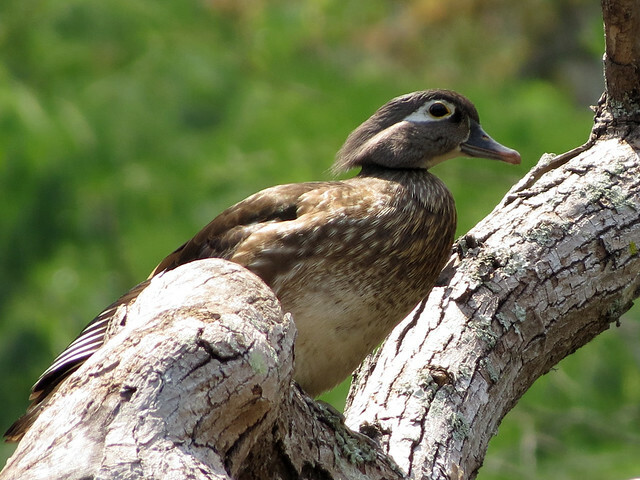 Not many cities have official birds, but in this case it seems appropriate considering Deltona is home to Lyonia Preserve, which is in turn home to several families of the endangered Florida endemic. I think it’s safe to say that a hike through the scrub habitat at the preserve will reward birders with a Scrub-Jay encounter more often than not. On a walk at the park last month, Arthur and I counted at least 9 individuals, some of whom were kind enough to pose for photos. 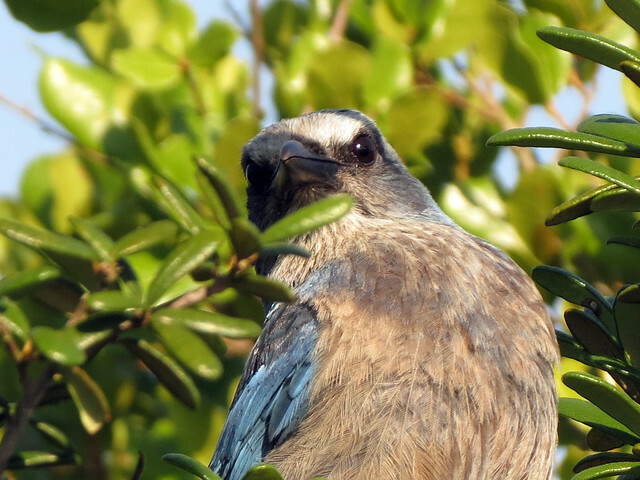 Like most corvids, Florida Scrub-Jays are highly intelligent, and extremely curious. They are also known to be tame, but this trait can be a serious problem for this endangered species. 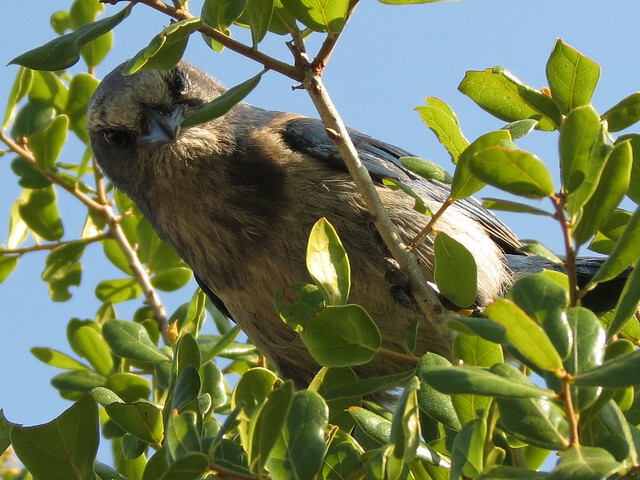 Although they may approach humans for food, people should never feed wild Florida Scrub-Jays. 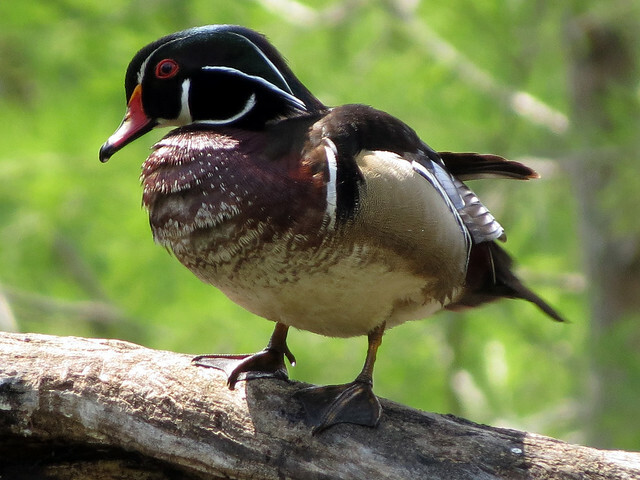 Habituation to humans is unsafe for a variety of reasons, one of which is that being provided food not normally available in their natural habitat can be disruptive to healthy development of growing chicks. Earlier this year, Arthur noted an online announcement for a field trip hosted by a local Meetup group: Lyonia Preserve: Hike. The main purpose of this trip was to “do a short hike and feed the Scrub Jays” (emphasis mine). Participants were advised to bring along pine nuts. What the HELL? 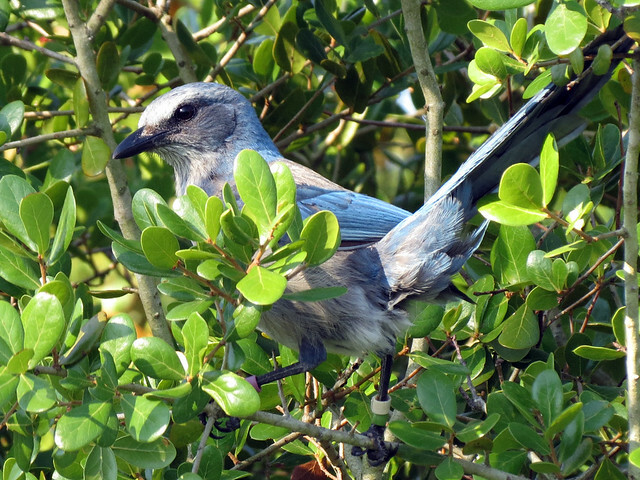 Unfortunately, the fact that feeding Florida Scrub-Jays is bad for the birds, not to mention illegal, does not discourage some people from this practice. 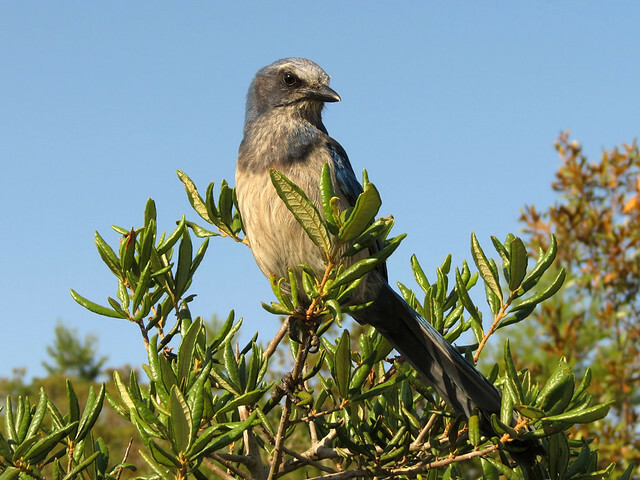 When we visit Lyonia, we are thrilled with every bird sighting and every natural, un-baited Scrub-Jay encounter. 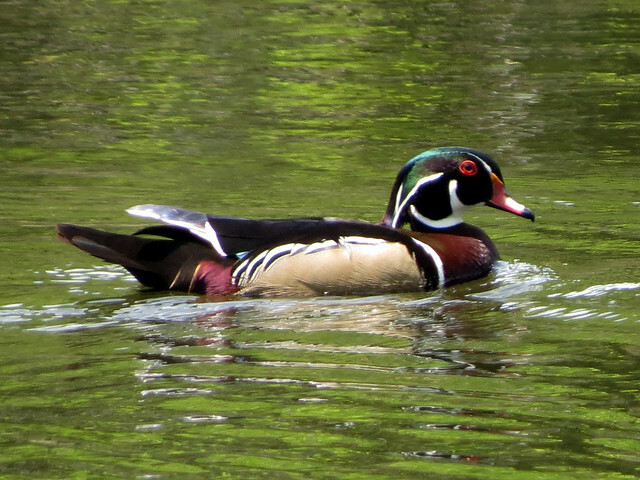 On May 23rd I counted one of the most abundant birds in my neighborhood for the Bird-a-Day Challenge. With Osprey as my 144th bird, I’m finished in the game for 2012. It was already getting tough at the beginning of May, but I was relieved to reach May 8th, so I could count some non-Florida birds on my list. Though I did a fair amount of birding, I didn’t manage to take one photo of any of my game birds during my visit to family and friends in Illinois May 8-15. They were all new birds for the year (May 10th’s Black-throated Green Warbler was my 200th bird of 2012). When I returned home to Florida, I knew my days in the game were seriously numbered. My first day back, I had to use a neighborhood regular, the Northern Mockingbird. A lucky, rare flyover of Roseate Spoonbill at Gemini Springs gave me an extra day, as did the Common Nighthawk Arthur and I spotted at Epcot at the end of our visit on May 18th (I literally jumped up and down for that one – it saved me Rock Pigeon for another day). An eBird alert sent me to a previously-unknown-by-me wetlands in a neighboring town to find Semipalmated Plovers on May 19th. Everything else was entirely expected and a misery to check off each day. Now at least I have a nice goal for 2013. And I am ready for the next game for this year: the June Challenge! 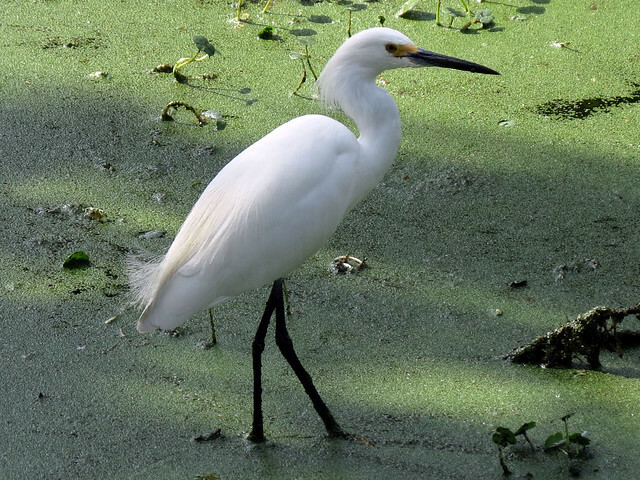 I first learned about this by following the Florida birding listservs last year, and from this great post by favorite Florida blogger Limeybirder: June Challenge. We moved here late in the month so I didn’t participate. In 2004 Becky Enneis proposed a contest. 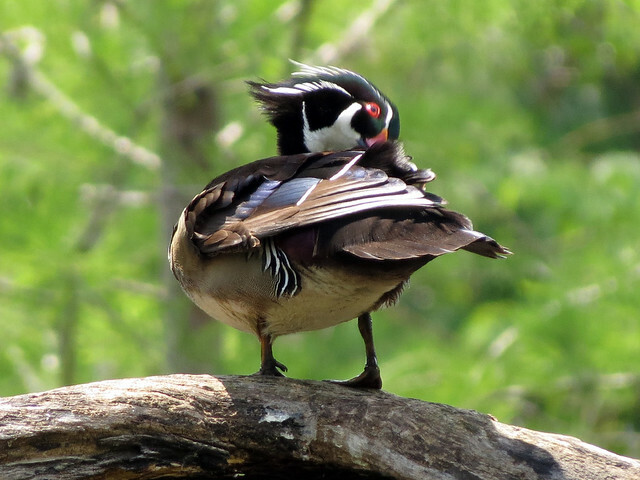 She was scandalized that most birders spent the summer indoors, and she thought that competition might motivate some of them to get out in the field during the warm months. And so The June Challenge was born. – Birds must be seen. No heard-only birds. Last year, there were two participants for Volusia, coming up with totals of 120 (119 / 1) and 73 (73 / 0). I’m going to try to get at least 75, but that sounds very ambitious for an inland Volusia girl. We’ll see! I’m looking forward to trying out this new challenge. 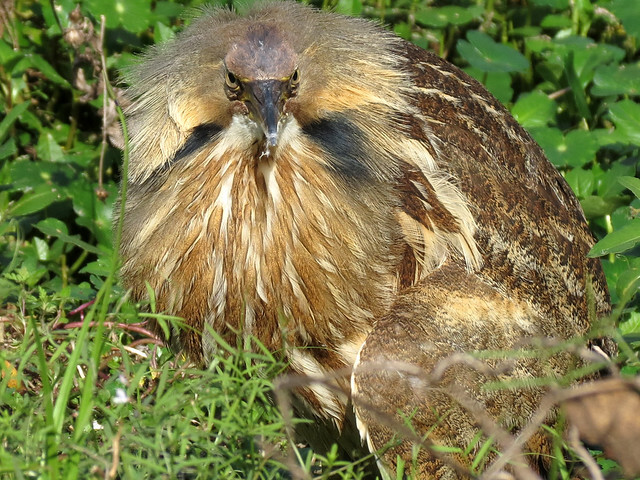 Good luck to all that continue with Bird-a-Day! All of the photos in this post are from a 4 May 2012 Gemini Springs outing. 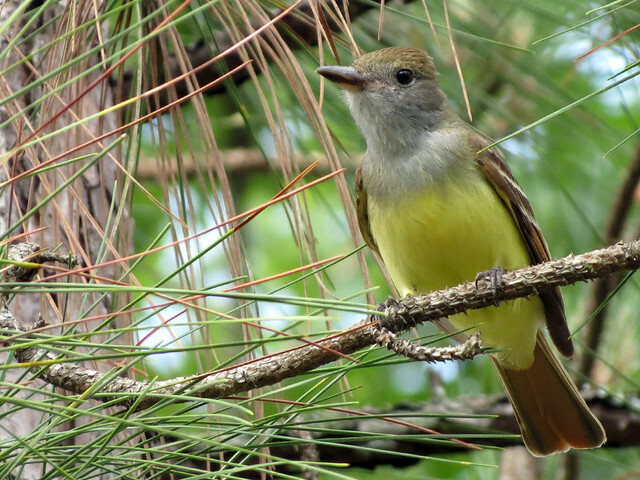 I saw my first Great Crested Flycatcher of the year on March 27th, in our neighbor’s yard. About a month later, Arthur and I had some excitement when we spotted a pair of them checking a large nestbox we had put up in our back yard. When we purchased the Screech Owl box, I learned which other birds might use it – the list included a few woodpecker species and the Great Crested. So when I saw a pair flitting about in our yard, I stopped to watch them, and silently willed them to head towards the right tree. I was so excited to watch them explore the box! The birds were eventually chased out by squirrels (who’s the tyrant?! 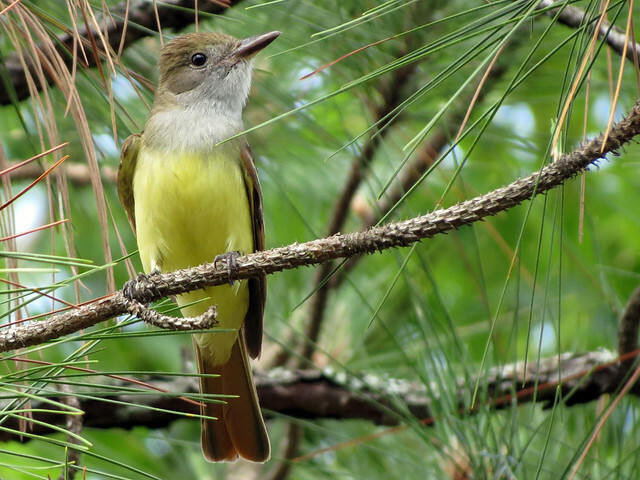 ), but we still see and hear these large flycatchers in our yard and neighborhood frequently. Great Cresteds were among the 83 species I saw during my recent trip to northern Illinois. A pair of birds was exploring a few natural, woodpecker-carved cavities in trees along the Des Plaines River at Ryerson Conservation Area. Some in our group were skeptical that they nested in cavities… but I knew. 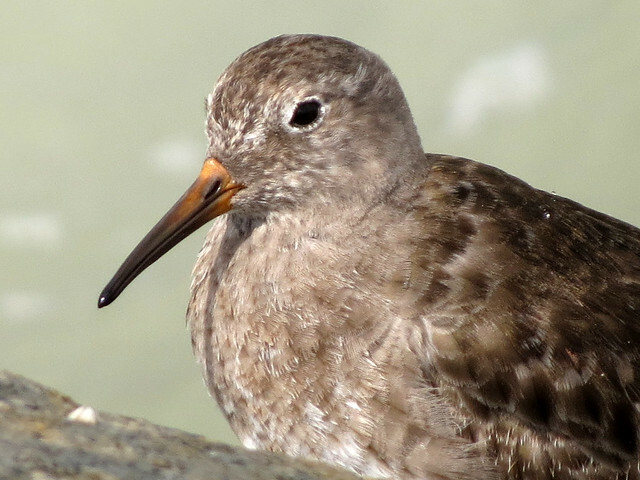 🙂 Ryerson is where I first recorded this species on my life list, back in 2009. My most recent sighting occurred this afternoon during my volunteer shift at the Audubon Center for Birds of Prey. 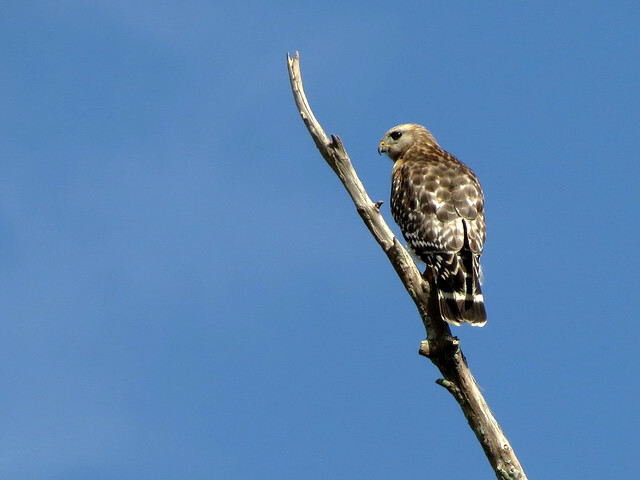 I followed a pair as they flew among the trees behind a row of hawk mews. Wouldn’t it be great if they were nesting there? See something odd happening on the back end of this turtle? What’s that coming out of the rear left leg? This morning at Lake Lotus Park in Altamonte Springs, Arthur and I stopped along the boardwalk to watch a small Red-eared Slider struggling to climb onto a floating log. Once it clawed its way onto the the log, it started walking as if it had something on its plastron which prevented its back legs from reaching the surface at the correct angle or position. The turtle slid back into the water but when it climbed back onto the log moments later, it still had the same problem. As we continued to watch we finally noticed that it had a rather large leech stuck to its body. It appeared to be scooting around the log to try and remove the leech. This video shows the turtle’s first ascent onto the log and a couple of moments of subsequent leech-scooting. 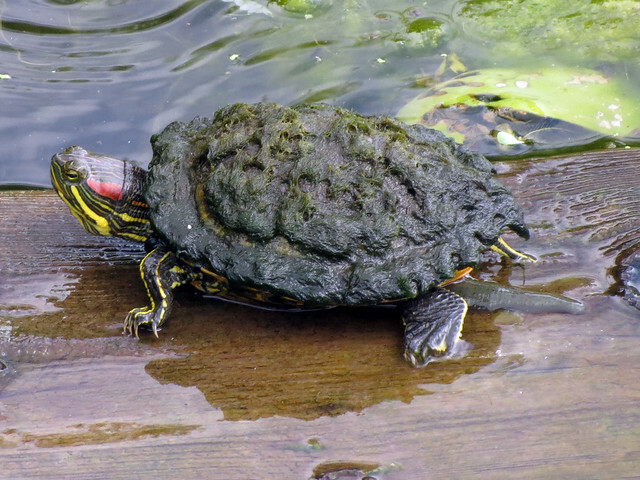 It is very common for turtles to carry leeches. I had no idea of this before today. 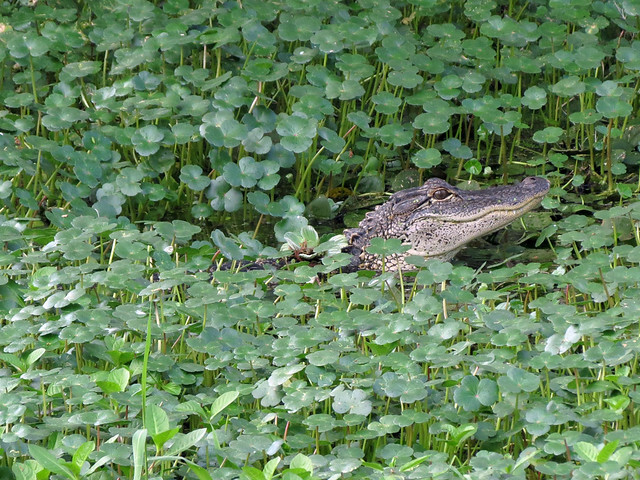 In Googling for information about turtles and leeches, I came across an older post from one of my favorite Florida bloggers, who wrote: “It’s extremely common to find leeches on turtles in Florida. In fact, it’s so common, that if I had to go collect a bunch of leeches, I would start flipping turtles.” Well, how about that? Leeches survive by attaching themselves to a host animal and sucking blood. 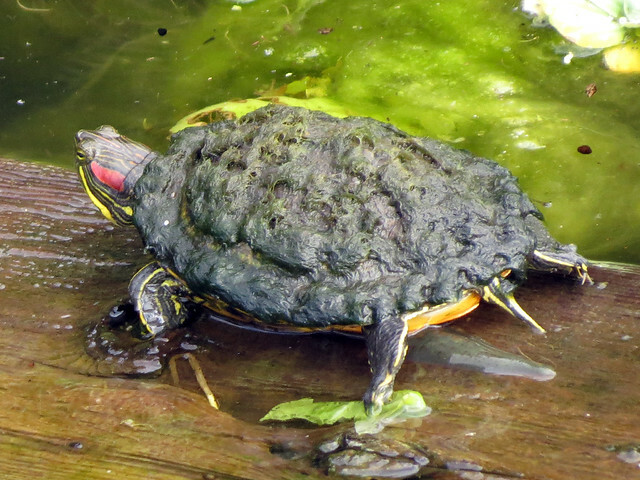 When turtles bask in the sun, sometimes their leeches dry up and fall off. Good luck little slider, and thanks for today’s new thing learned. 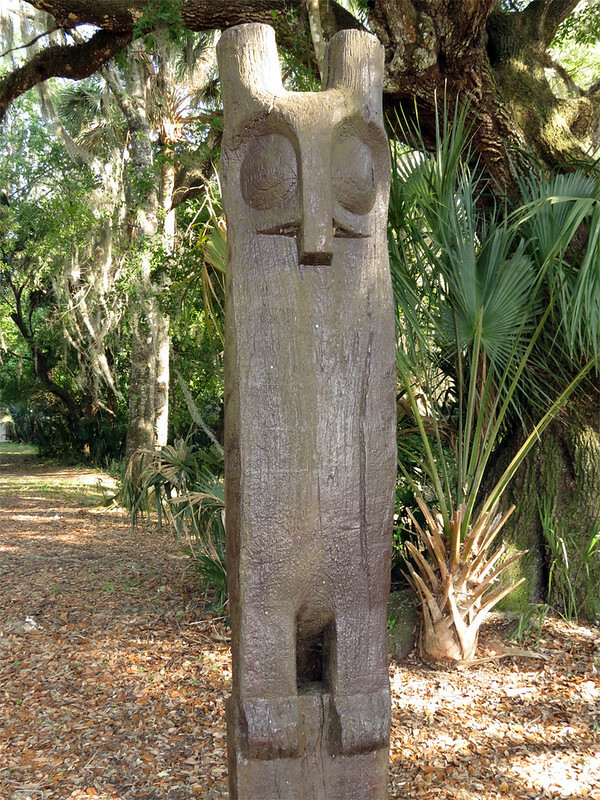 A large statue of an owl was recovered from the St. Johns River near DeLand, Florida in 1955. 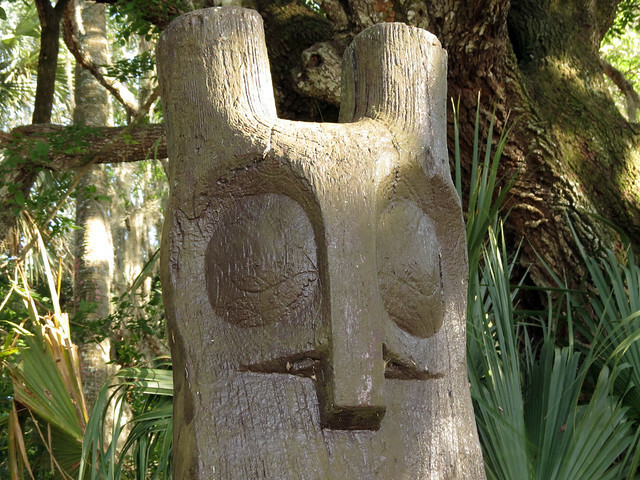 An artifact of the Timucua Native American tribes that historically lived in the area, the original pine wood statue dates from 1400-1500 A.D. The original piece is on display at the Florida State Museum in Gainesville. A replica of the statue stands on Hontoon Island, a state park cut out of the St. Johns River near DeLand. 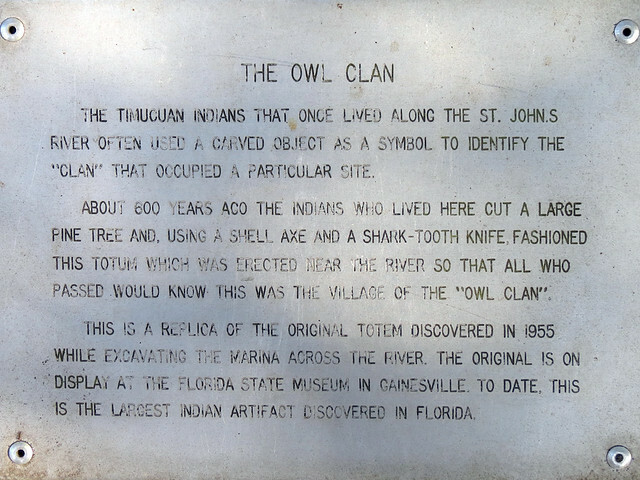 The owl totem identified the local “clan” of Timucua; similar statues representing a pelican and an otter were found elsewhere along the St. Johns in 1978. These three totems are the only such Native American statues found in North America outside of the Pacific Northwest. The owl totem is remarkable for its large size. 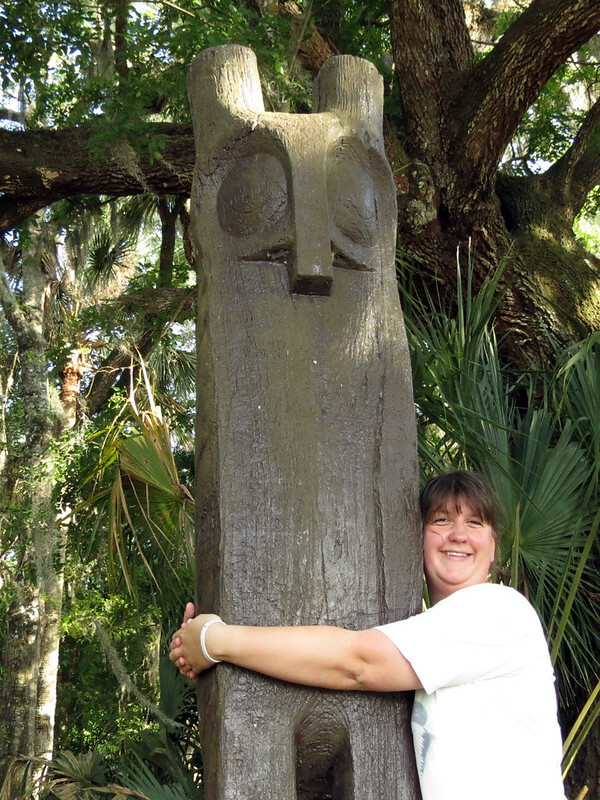 The stylized totem statue probably represents a Great Horned Owl and stands over six feet tall from horns to talons. Interestingly, the totem owl has five talons, instead of the four naturally found on Great Horned Owls. Was there perhaps a bit of anthropomorphizing among the Owl Clan? I’m not judging. In fact, as a lover of owls, I say — sign me up for the modern version of the Owl Clan. 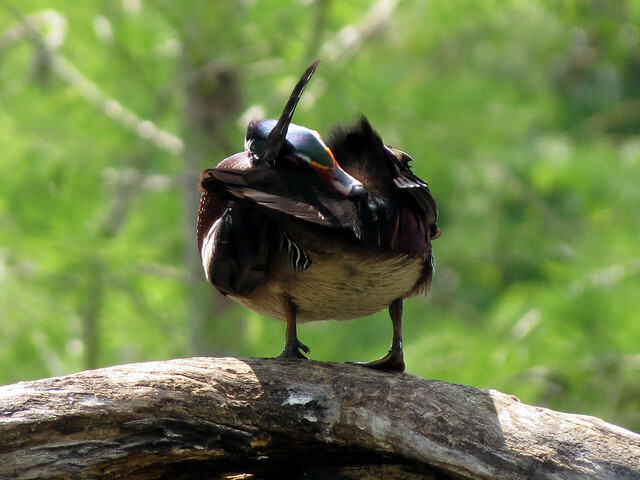 How does a Wood Duck know when it’s time to take a bath? I happened to be watching this one when it was time. He looked quite clean to me, but what do I know? 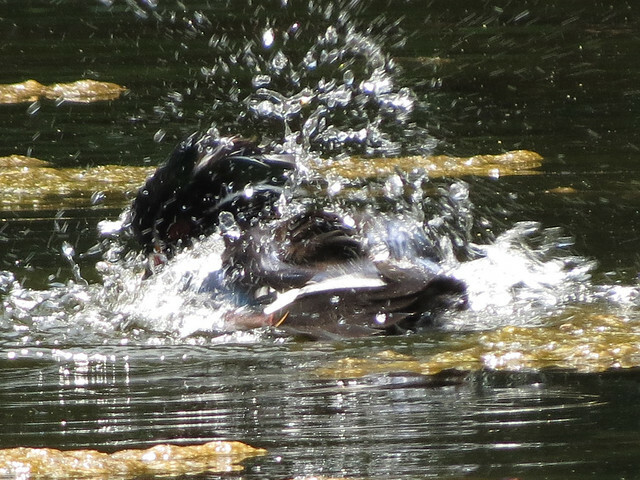 After a whole lotta splashin’ was going on, he joined his companion on a nearby snag for some serious preening. 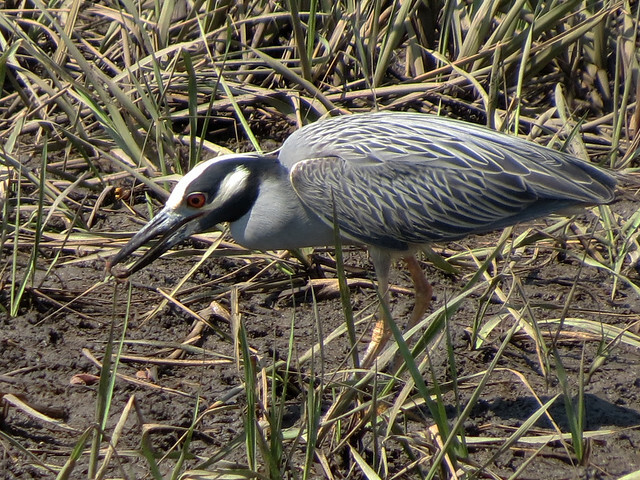 At the end of March, Arthur and I took a day off to do some birding at a few spots in Volusia County. Lately I’ve been really interested in increasing my home county list, so I trolled eBird for birds missing from my year list. I determined our route based on a rather long wishlist of needed birds. Our first stop was a hotspot I’d never been to before: Longleaf Pine Preserve outside of DeLand. Here I had a target list of way too many birds. We had a very nice 6 mile hike where we recorded a total of 15 (!) species, only one of which was on my target list. We first heard and then had very nice looks at a male Bachman’s Sparrow singing in typical habitat for this species. This one target was also the only potential lifer we expected here, so, you know, mission accomplished! Next we stopped at Port Orange Causeway Park, located under Dunlawton Avenue where it crosses the Intracoastal Waterway. 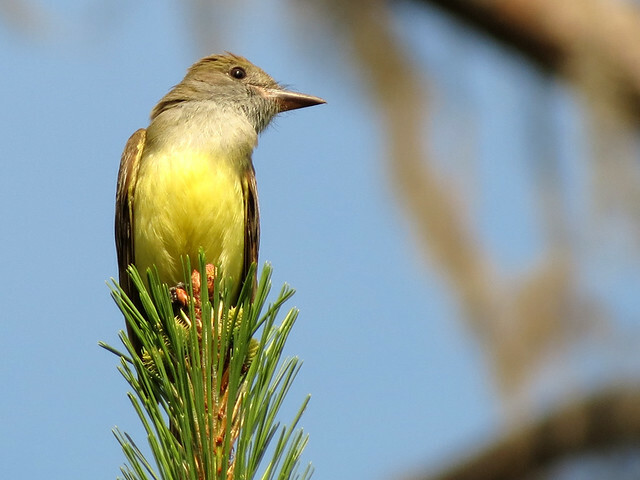 Part of the park looks over the Port Orange Sanctuary, though birds can be viewed from all over this eBird hotspot. 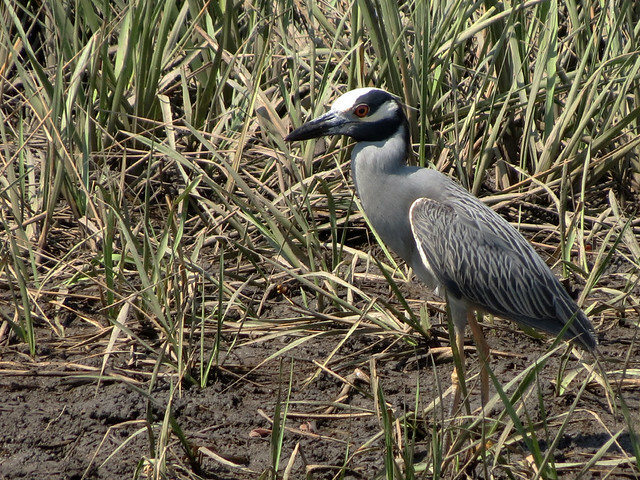 My two targets here were American Oystercatcher and Reddish Egret; we found both. After this short visit we headed to our final destination for the day, to search for the subject of this blog post. Lighthouse Point Park is located in Ponce Inlet, close to the lighthouse, natch. The lighthouse isn’t in the park, though, as signs at the park entrance take great pains to inform all visitors. Anyway, the beautiful beach and clear water attracts families and sunbathers, and, during our visit, lots of surfers. 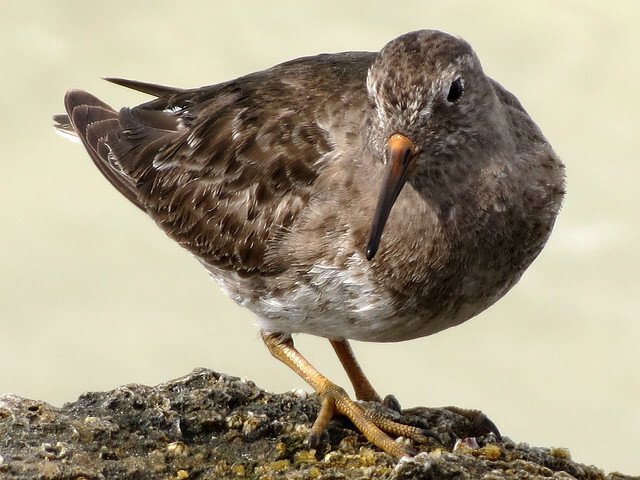 I had just one target species here: Purple Sandpiper. We found an active bird as we walked along the jetty. 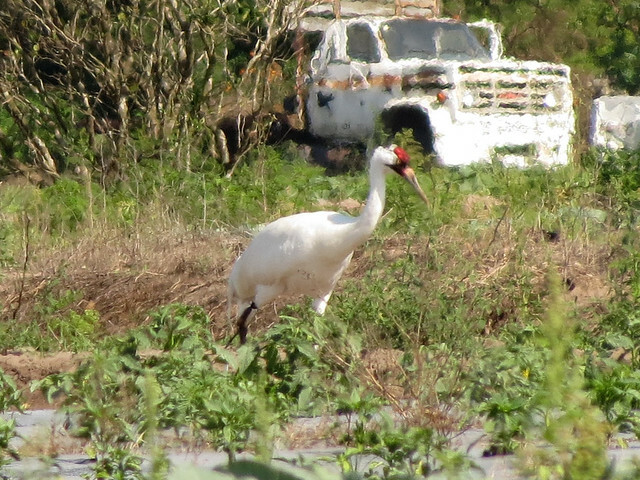 This was not a life bird, but it was new to my U.S. list. 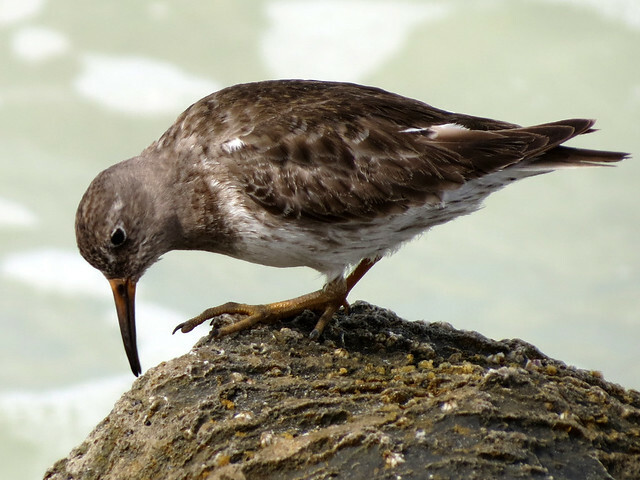 Previously we had seen Purple Sandpipers along a different jetty on the other side of the Atlantic, at IJmuiden. 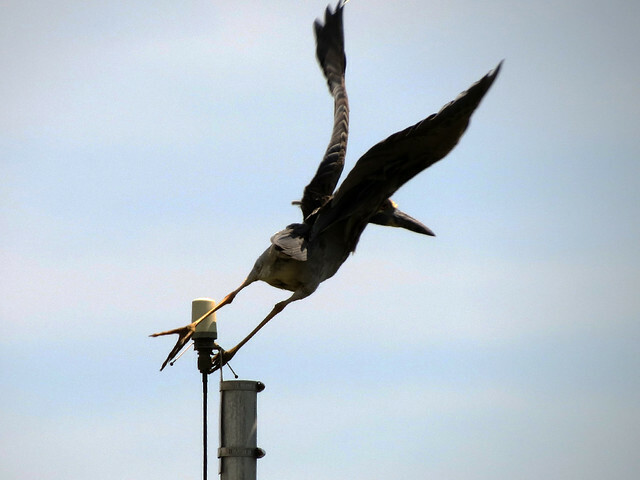 I’ve submitted this post to the current Bird Photography Weekly. 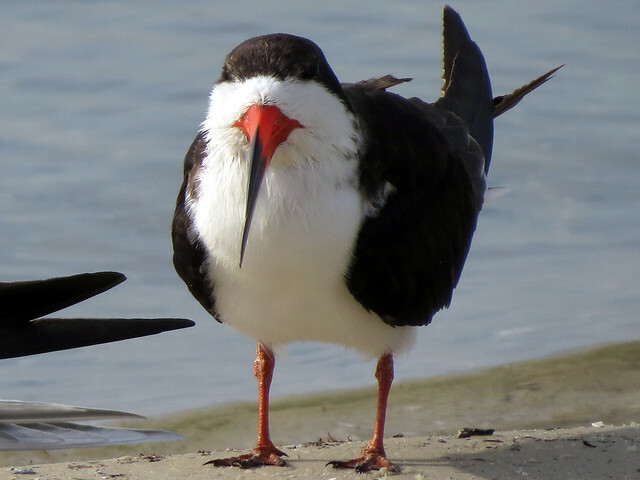 BPW is a regular collection of user-submitted bird photos from all over the world. The new edition comes out every Sunday. Go have a look at this week’s submissions! For my birthday back in February, Arthur and I had a nice little two-day trip to the west coast of Florida. 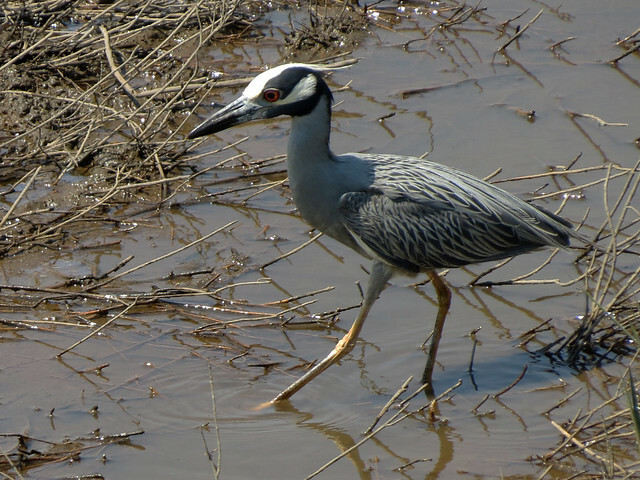 I based our loose itinerary on recent rare birds reported to Florida birding listservs. 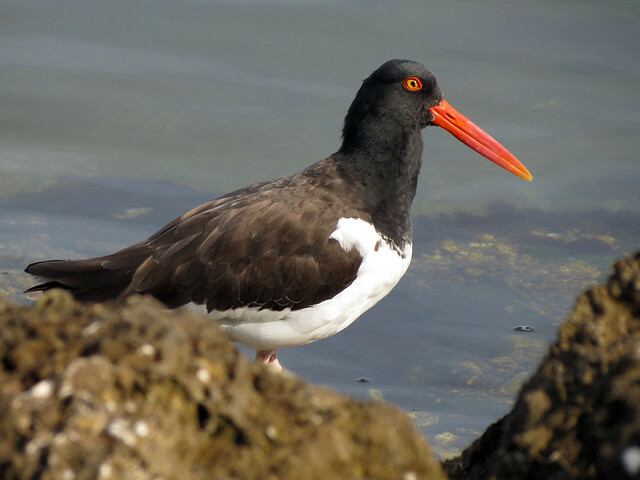 We started out on Sunday the 26th with a Green-tailed Towhee in the morning, pelicans, shorebirds, and ailing seabirds in the afternoon, and a Lark Sparrow late in the day. 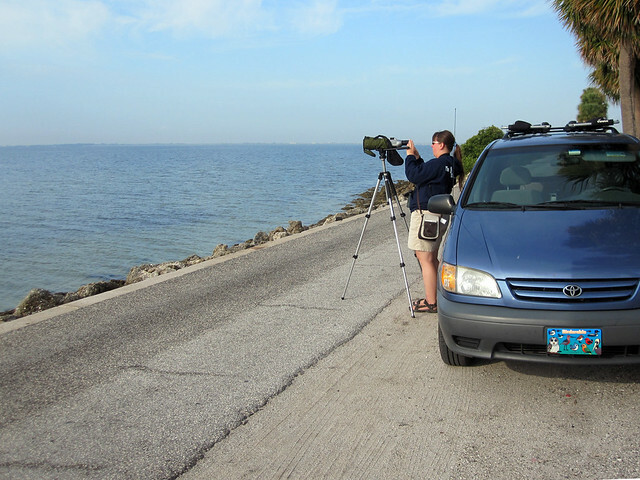 On Monday, my birthday, we first headed to the Courtney Campbell Causeway on Old Tampa Bay to look for another target bird. 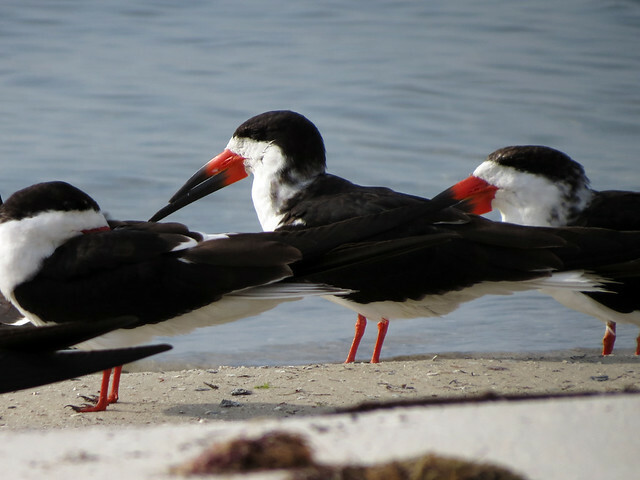 We drove up and down the access roads on either side of the causeway, looking for our target in the water, and checking out the birds that were loafing along the roadway and in the bay. 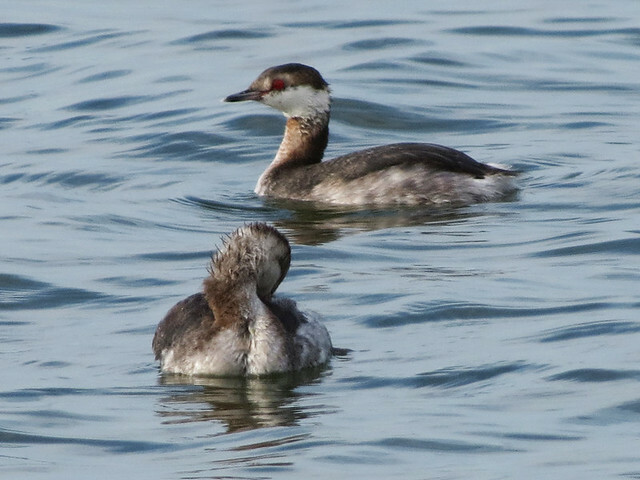 After several hours of searching, we had a nice list of birds for both Pinellas and Hillsborough counties, but we still didn’t have our target. One last round, we said. One last look around, we decided. 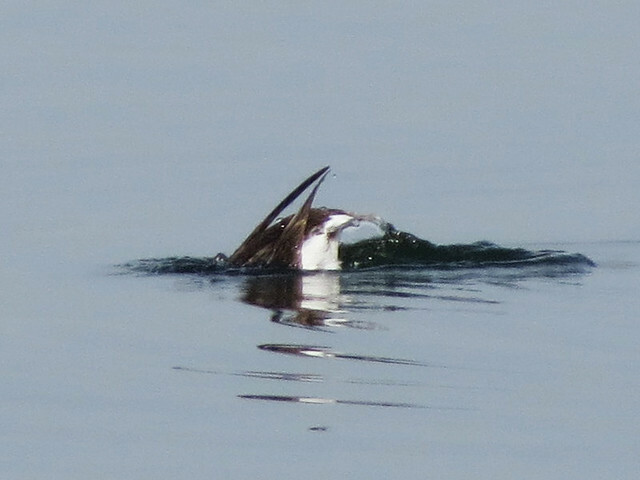 And on the last round, close to the county border, we found our bird, swimming alone out on the bay. 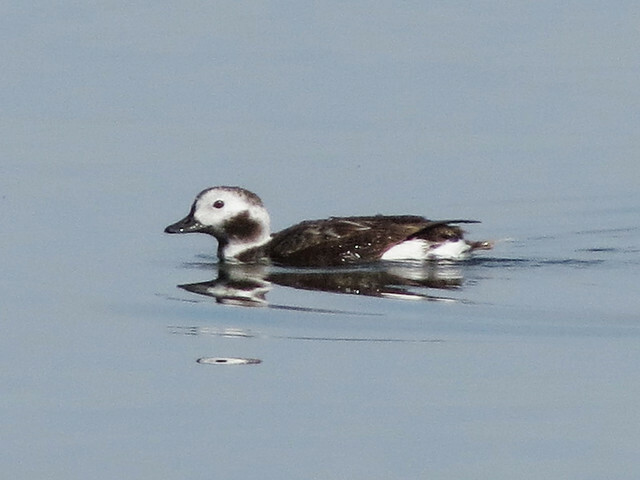 Long-tailed Ducks don’t typically range this far south, though stray birds show up across the south and elsewhere out of range fairly regularly. We, and the bird, were in Hillsborough County. The duck was swimming towards Pinellas County… so we waited for that extra county tick. 🙂 It wasn’t a lifer but it was certainly nice to get a new state bird, in two counties even! 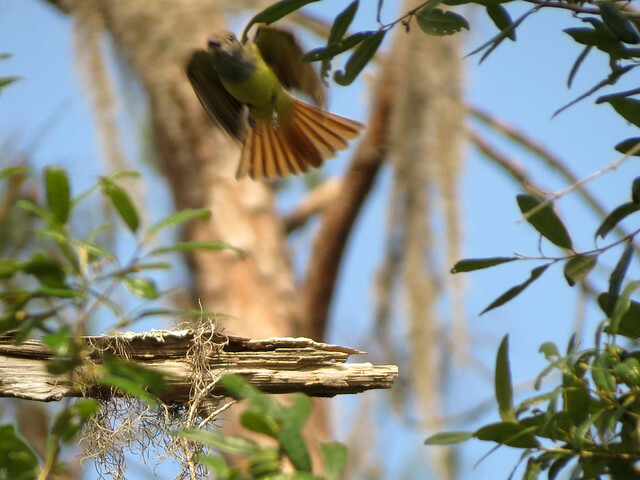 Our next stop, somewhere between Tampa Bay and home, was another Florida birding hotspot: Circle B Bar Reserve near Lakeland in Polk County. I didn’t have any specific target birds here. 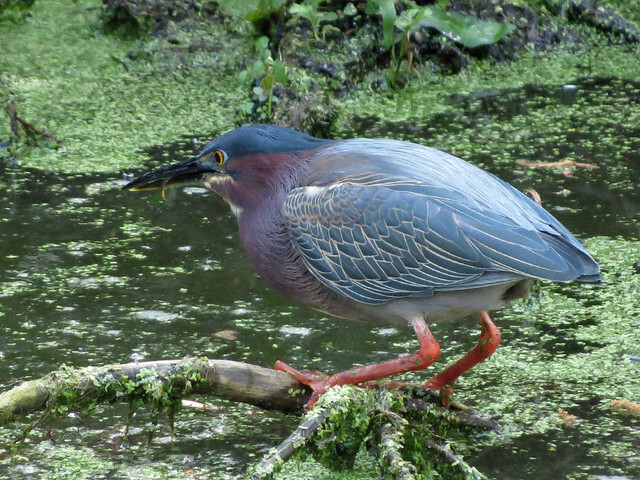 We were lucky to see a pair of Purple Gallinules who were not kind enough to pose for photos. 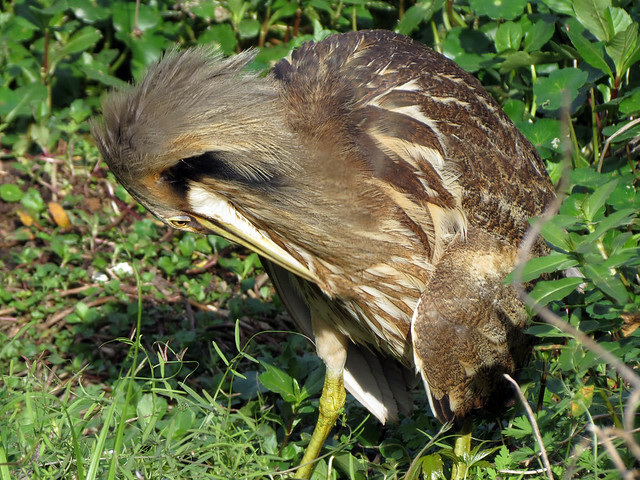 First though, there was an American Bittern who was so accommodating that we actually left the bird while it was still in plain view – this after many minutes of intimate observation. 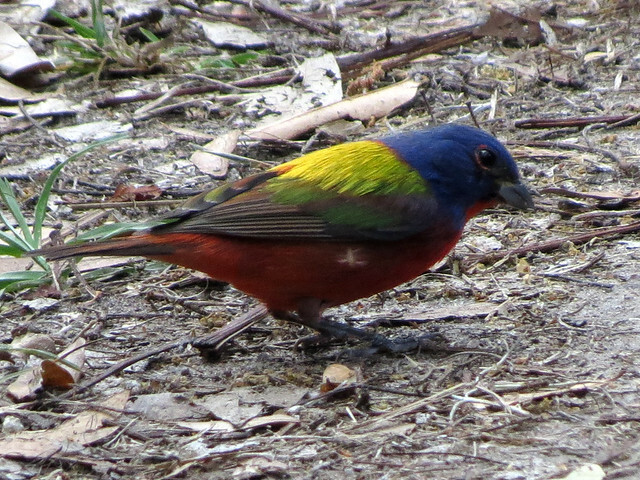 Later we were delighted to find a male Painted Bunting land in the path directly in front of us. 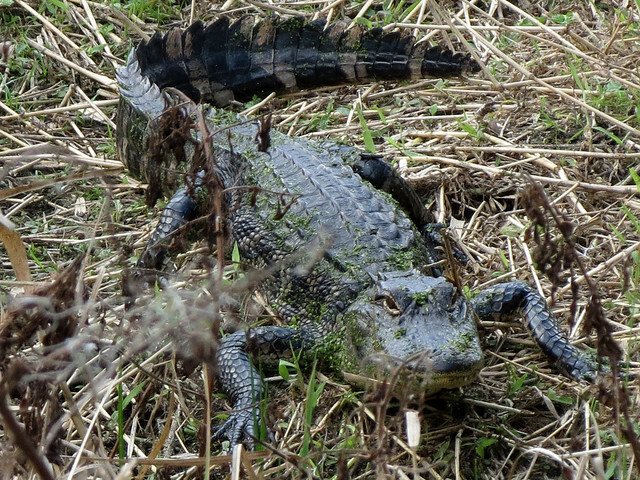 And there were waders and gators everywhere. Circle B lived up to its reputation and we are looking forward to future visits! 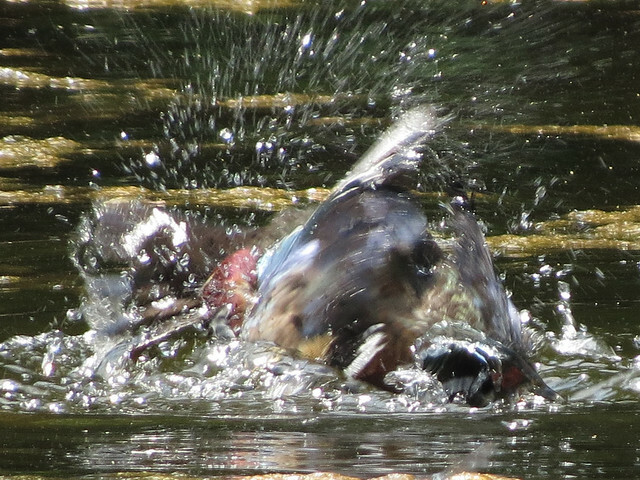 And in the meantime I have some very nice memories of a birthday birding blitz. 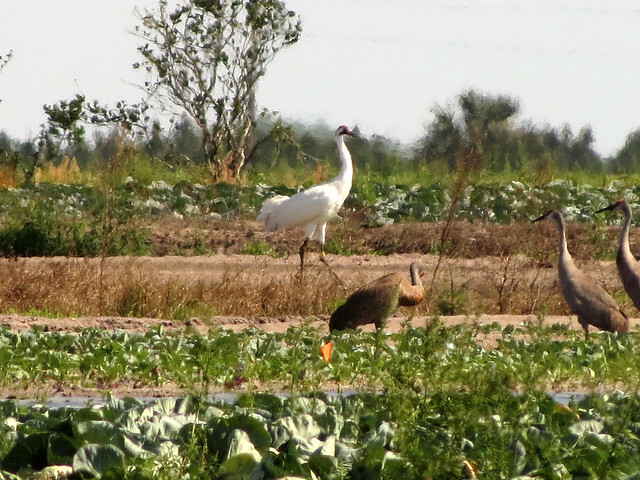 Efforts to save the highly endangered Whooping Crane included the attempted establishment of a non-migratory population in central Florida. 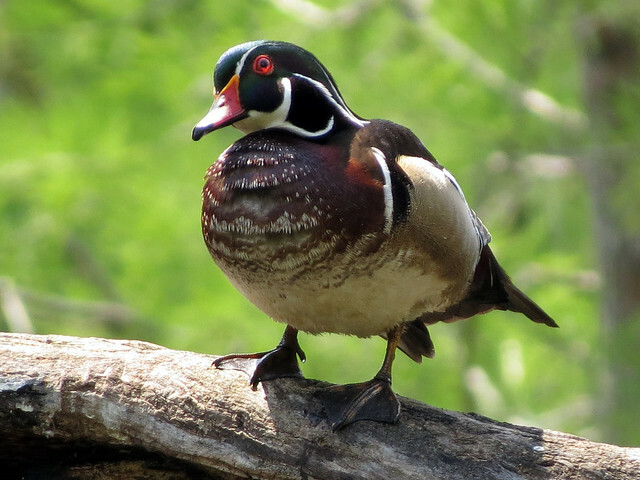 Since this effort was deemed unsustainable due to high mortality and low reproduction, the flock today is down to just 20 birds from 53 individuals in 2006. 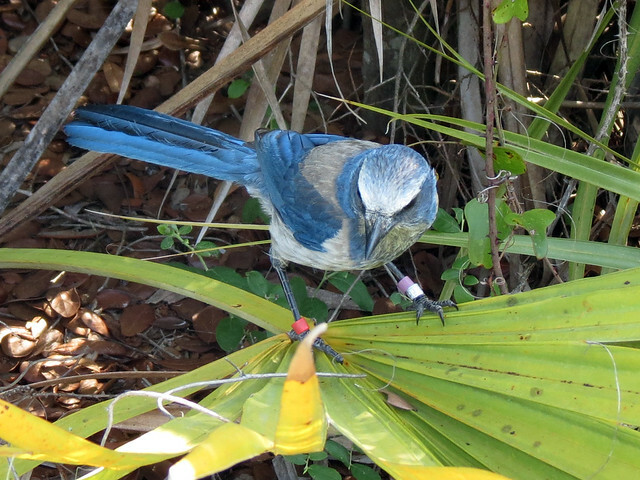 The birds are still being monitored, however, and last year camera traps were set up to study nest sites. One nest site is also being monitored by a data logger, which measures temperature change and other data. 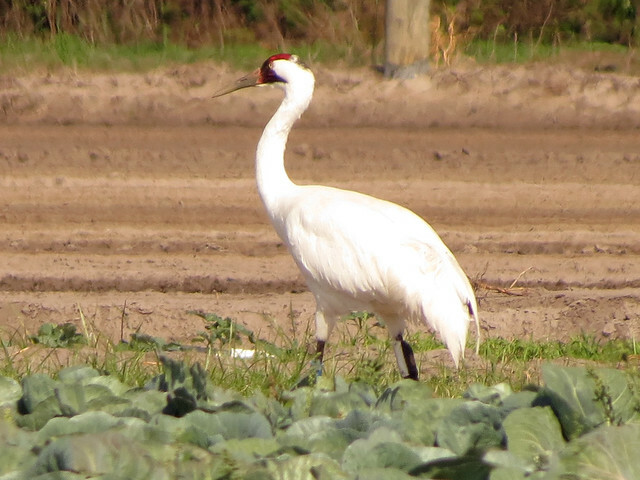 Birds from the Florida non-migratory population are spotted by birders fairly regularly, so when a pair was reportedly seen on a farm field in nearby Lake County, Florida, Arthur and I drove out to see if we could find them. They were hanging out close to a flock of Sandhill Cranes and very easy to find. We kept a respectful distance and observed them, using our car as a hide. 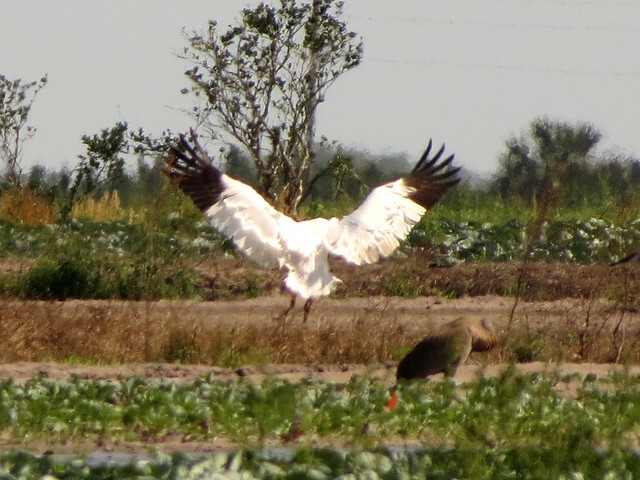 Whooping Cranes sightings should be reported. 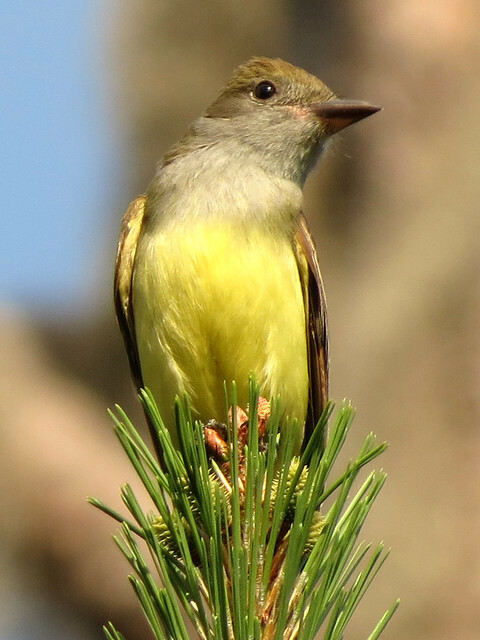 Birds seen in the eastern United States can be reported to USFWS using this form. 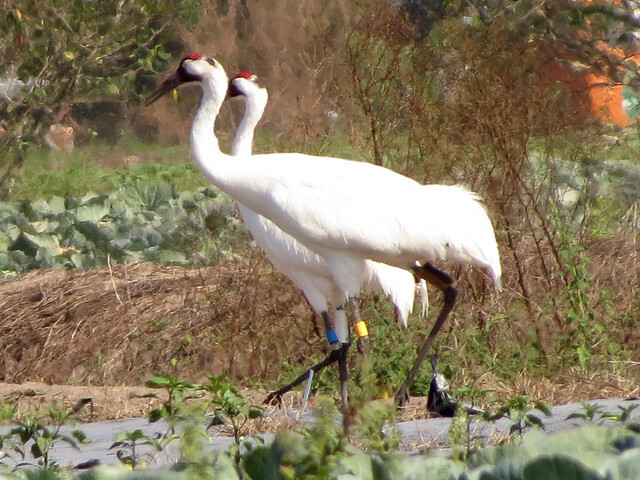 Based on the band colors these birds are wearing, we knew they were part of the non-migratory population. 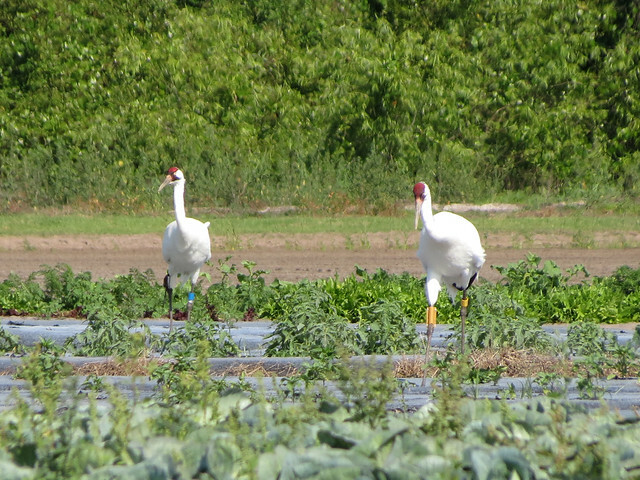 Migrant Whooping Cranes are also found in Florida during the winter, and those sightings should certainly always be reported to USFWS. 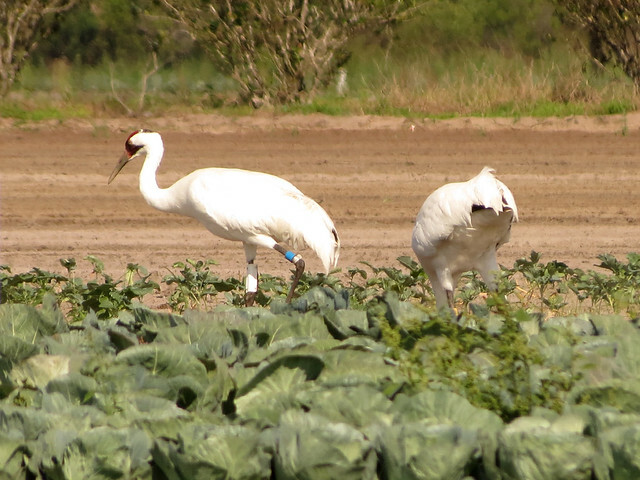 Although we are grateful to be able to see these birds after their location was mentioned on a public mailing list, we believe that all sightings of Whooping Cranes in the wild should be shared with extreme discretion.